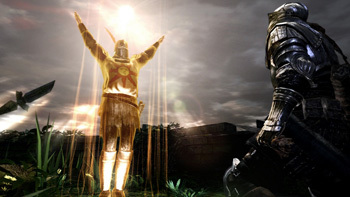 Hard working fans continue to improve the abysmal Dark Souls PC port. The PC port of Dark Souls is a bit of a mess. This doesn't come as a surprise. In fact, From Software was admirably up-front about the fact the port would lack features many PC gamers consider essential. Fortunately, several modders have stepped in to fix the game's more glaring technical issues. Shortly after the title's release, NeoGAF user, Durante, managed to enable resolutions higher than 1024x720. Now another modder has managed to bypass the game's 30 frames-per-second limitation, though at the cost of its online features. To run the mod - which is available here - you'll need Durante's original mod. Keep in mind that the YouTube video of the mod in action is limited to 30FPS, so you'll need to grab the downloadable version of the video to see the full effect. While I'm a sucker for high frame rates, I'm not sure if losing the game's unique multiplayer features (no jolly cooperation) is worth the smoother gameplay. You'll also need a beefier PC to maintain a constant 60FPS, particularly in notoriously choppy areas like the New Londo Ruins or Blighttown. And before someone brings it up, yes, the human eye can perceive frame rates higher than 24FPS and yes, there is a big difference between 30 and 60 FPS. The fact the PC community has decided to fix Dark Souls, rather than just write it off as yet another bad port, is a testament to the game's popularity, or the masochistic tendencies of your average PC gamer. Either/or.